New to preserving or canning? Follow our step by step guide and you will soon be stocking up your cupboards with scrumptious strawberry jam and other delectable delights! Simply click on the steps below to start the preserving process. Please read the information provided in the guide to sterilizing and select the method you find most suitable. Hint: Always sterilize more jars than you think you will need because inevitably you will always have more recipe than jars if you don't. Important note: do not attempt to sterilize your Kilner® bottles and jars by pouring boiling water into them. Before you start the sterilizing process, check your jars carefully for any cracks or chips. If any damage is found, please discard your jars. Once you have selected your recipe follow its instructions for preparation and making. Hint: always read your recipe through a couple of times before you start making so that you are familiar with the process and have all of the ingredients to hand. Once your recipe is ready carefully remove your sterilized jars from the vessel keeping them warm. If they contain any water tip it away carefully. 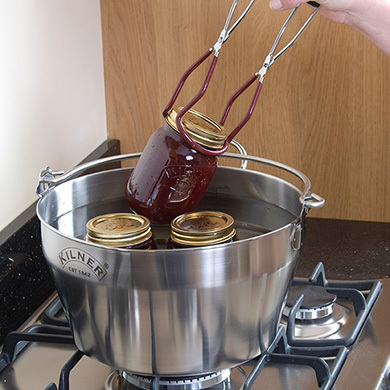 Always make sure you handle hot jars carefully, use a jar tong or oven gloves for protection. 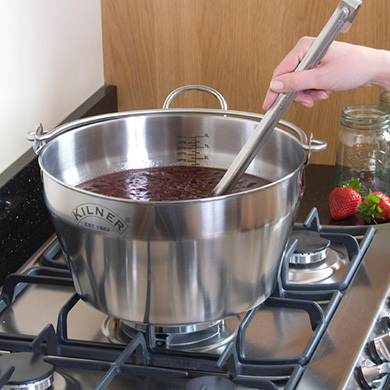 Place the empty jars by Kilner onto a heat proof surface such as a chopping board and place a funnel, into your first jar, then using a ladle, transfer your recipe from the pan to your Kilner ® jars making sure to fill them to the point indicated by your recipe. Once each jar is filled use a non metallic spatula to remove any air bubbles by running it around the inside of the jar (between the food and the jar). 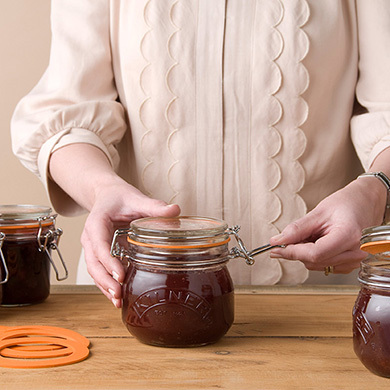 Now your Kilner® jars are filled you need to close them whilst the contents are still hot. 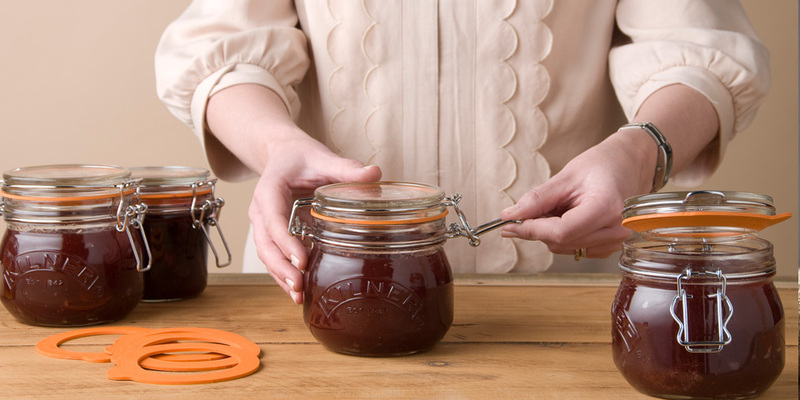 If you are using a Kilner® Preserve Jar, place the discs onto your jars, add the screw top band and tighten. If you are using a Kilner® Clip Top Jar, place the rubber seals onto the top of the jar and close the clips. Place the jar in a large pan and cover the whole jar with water. Bring to the boil for 30 minutes. Once boiled, leave the water and jars to cool completely before removing. 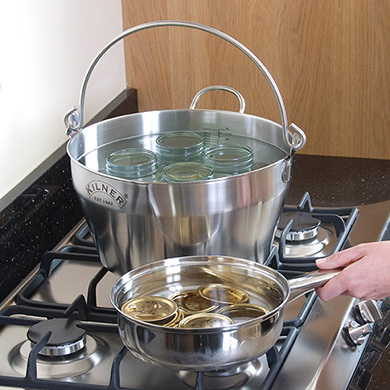 The process of boiling the jars in water is adding extra heat to the contents, which is allowing a vacuum seal to form. Now that your jars are closed you need to leave them to cool for 24 hours untouched. After the 24 hour cooling period you need to check your jars to make sure an airtight seal has formed. To check the seal of a screw band Kilner® jar; undo screw-band and lift the jar by the lid only. If an airtight seal has formed the lid will not move, now tighten the screw band and store. If the lid moves, an airtight seal has not formed and you must reprocess your jars or eat the contents immediately. To check the seal of a Kilner® Clip Top Jar; undo the clip and lift the jar by the lid only. If an airtight seal has formed the lid will not move, now fasten clip and store. 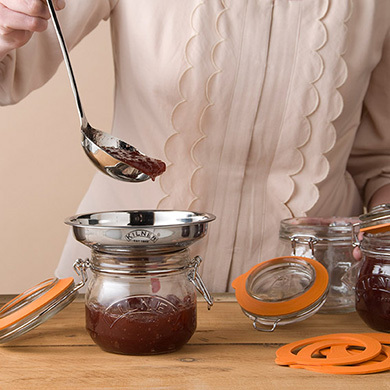 If the lid moves, an airtight seal has not formed and you must reprocess your jars or eat the contents immediately. Once the seals have formed, store your preserve jars in a cool, dry place for up to 6 months. Once the jars have been opened only store your jars in the fridge and consume the contents within 2 weeks.